Here is a little reminder that D#2 is not the only knitter around Chez Swine. The Gauntlets of Regret! Very cool and sort of naughty. 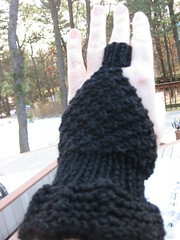 I whipped up two pairs of these, all from one skein of Cascade 220 Superwash. One pair for each of the daughters. Who also happen to be very cool and sort of naughty. My only regret about this project? That I didn’t think to take a picture until no one was home and I had to do it one-handed! these would offer some warmth, but the true purpose is to be a fashion statement, not intended for bobsledding. I detect an undertone of naughtiness at Chez Swine! But what if your favorite form of debauchery happens to involve bobsledding?